First a disclaimer. I'm not a great fan of group planting as it's impossible to water or fertilise individual succulent plants. Plants grow at different rates, so after some time a fast grower dominates the arrangement or a sprawling plant has grown all over the others. Also, when you come to re-pot a community planter the roots are all mixed up, so it is harder to repot without root damage. 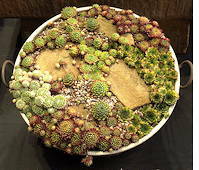 However, some people like group plantings and community bowls of succulent plants can look very effective for a while. Think of them as temporary arrangements that should be renewed and replanted at regular intervals. Planter: Try to use a bowl or planter with drainage holes. I like clay pots which confer stability and help excess water to evaporate, but lots of successful growers use plastic pots. It would be best to choose a container where you can water from the base by standing in a larger tray or dish. That decorative porcelain bowl inherited from grandma isn't ideal if doesn't have drainage holes in the bottom. Watering a pot without drainage is a delicate matter. Excess water easily builds up and nothing kills succulent plants faster than soggy roots. However, you might be able to use your decorative bowl to hide a suitable-sized pot with drainage, in which your cactus garden is planted. Choice of succulent plants: Ideally choose succulents or cacti that remain small and compact and are of a similar type so that their watering requirements are similar. 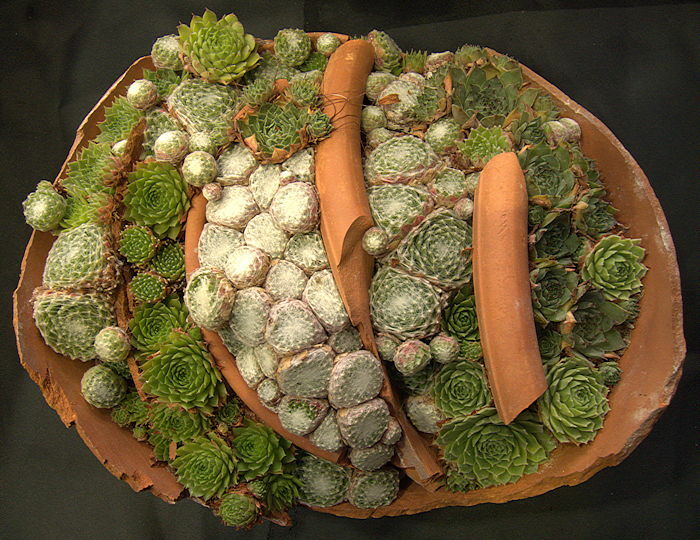 Plants from within one succulent plant family often look more attractive together than a disparate mix from different families. 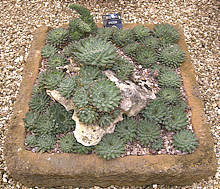 Alternatively, a selection of succulent plants from a particular geographic area could be made. Very effective arrangements of differently-coloured Lithops (living stones) are sometimes seen at cactus shows. It would be possible to make an attractive planted arrangement with a selection of Adromiscus with different leaf forms and colours. Many cacti remain fairly small throughout their life and flower freely including some Mammillarias, Rebutias and Gymnocalyciums. Making a Group Planting: Succulent plants bought from a "garden centre" or superstore are often in small plastic pots in some sort of peat-based compost without sufficient drainage. Peat based composts seem to encourage root pests on cacti. The first thing I would do would be to get some larger pots and re-pot the new succulents in a loam(soil) based compost mixed with about a third by volume added grit. Chicken grit (2-3mm) is about right if you can get it. If you see the stony soils that wild cacti grow in, you will probably start adding more and more grit. If you are going to re-pot into a group container use this sort of potting mix. Use an old plastic label or bit of stick to tease the old soil from out of the roots and spread the roots out so they will grow into the new potting mix. This is also a good time to inspect the roots. If you see any white fluffy stuff, the plants have mealy bug or root mealy bug. Treat by watering with Provado Vine Weevil killer or any systemic insecticide based on Imidachloprid. This is very effective and not as toxic to plants and people as the old insecticides. In fact I would treat prophylactically, whether or not you see pests. Method 1 - bury pots in grit: One good way of making a group planting is to get a large deep container or trough, about an inch deeper than your pots, put the pots in individually (after re-potting as above) and then cover in between and over the top with gravel, grit or Hortag so it looks as if they are all in a landscape. You can add interestingly shaped stones and bits of weathered wood too if you like. Some people even add the odd toy animal. I draw the line there, but small plastic or ceramic lizards and beetles don't look too bad. This "planting" method has the advantage that you can get the pots out individually for re-potting etc. but can be made to look quite natural if you want. You can also move the pots round to change the layout from time to time if you get bored. Method 2 - plant in a large container full of compost: Alternatively, you can fill the container with a gritty loam-based potting mix and re-plant your succulent plants in that. Add a few rocks and top dress with grit or gravel to make a natural appearance. 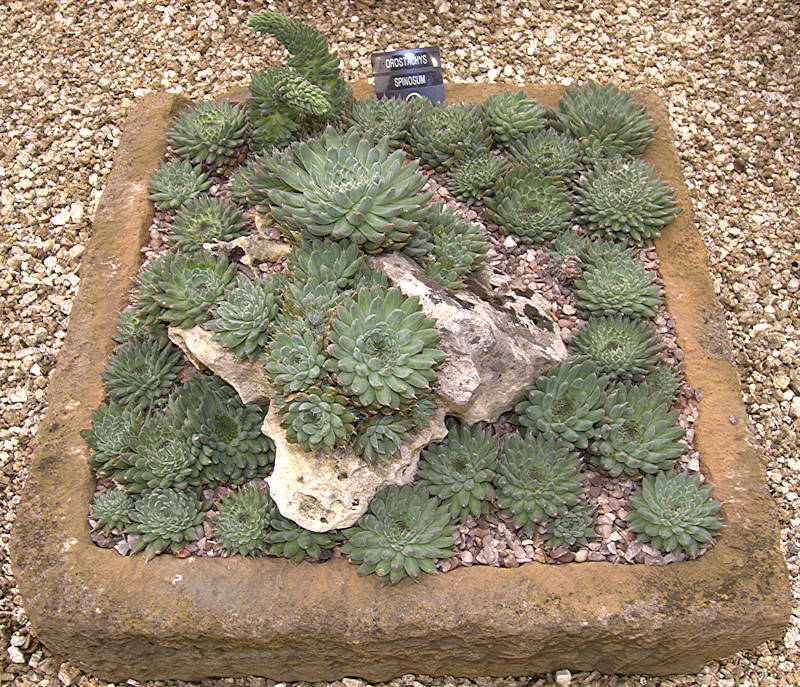 As they grow, you will eventually find some of the succulent plants unsuited to communal life and probably want to repot individually to make specimen plants. However, if you refurbish your container every year, and replace large older plants with small ones you can maintain its appearance. Terrariums: Terrariums and Vivariums are generally unsuitable for cacti as the humidity levels will most likely be too high and light levels too low. Epiphytic cacti and other succulent plants coming from tropical rain-forests or cloud forests may be an exception to this. 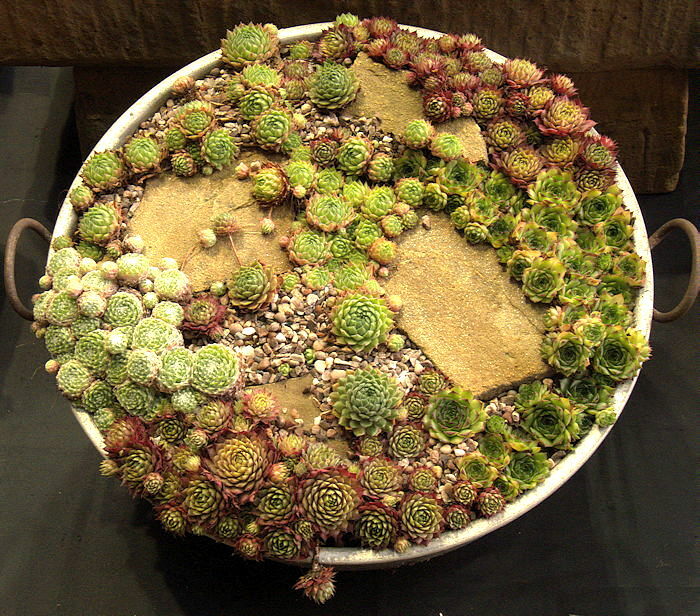 If you specifically want plants for a terrarium, there are interesting succulent plants that are more adapted to lower light levels and are less spiky for any other inmates. Peperomias and other members of the Piperaceae, creeping Ficus, terrestrial Bromeliads and many Gesneriads enjoy high humidity and come in a range of bright colours and leaf forms.